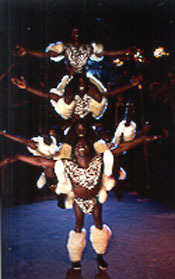 The Mapapa African Acrobats are a never before seen entertainment revue from the heart of Africa that is for the first time touring America. Originating in Mombassa, Kenya they have performed in over 25 countries in the last ten years, including Australia, China, Korea, Germany, France, Italy and Spain. They have only been performing in America since February of 1999 and have received rave reviews from critics and audiences alike. Their show can be upto one hour in length and blends what we have come to call "circus" acrobatics with popular dance moves set to live and taped African music. The result is an electrifying experience which is sure to move even the most jaded audience member. What we have here essentially is a re-evaluation of the variety arts which is as radical as that which happened to popular music in the late 1950's: the culture of youth, with all its energy, vitality and rhythm, has now taken over the circus. It is already a well-established cliche in our minds what a circus looks like: it is above all filled with white people and animals. There is an old fashioned style to the whole proceedings, whether it is the trumpeting of the big-band or the top-hat and tails of the aging ringmaster. Even when examples break the mold like the excitement which surrounded the Chinese-based circuses in the 1980's or Cirque du Soleil in the 1990's, the paradigm was still the same: the music and over-all performance style was out-of-step with the culture that our youth, and indeed what we ourselves, grew up with. As a result the circus has effectively died as a vital American cultural phenomenon. Circuses, even the most avant-garde like Cirque du Soleil work on the European concept of "spectacle". Even at its most glorious it is akin to watching a symphony. Let's face it, opera, the symphony and much of "higher" culture is an acquired taste most people can't relate to. It is one of the reasons why American culture with its egalitarianism has displaced its European counterpart in the hearts and minds of people around the globe. People want immediacy, they want in-your-face excitement. The reason that young people can't relate to slow-pace of the traditional circus performance is that they live in the same world that we do, which is fast-paced, rhythm driven environment of the MTV-generation. From Elvis Presley to Janet Jackson, the American culture that has so effectively transpanted itself around the world has been that of a "rhythm nation" which vanquishes all competitors. As a result the success of the first Mapapa tour has been both immediate and irreversable. 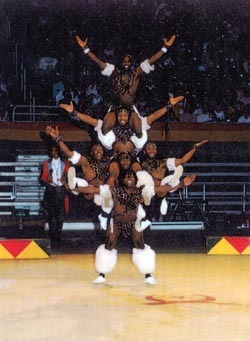 These first six African acrobats came like thieves in the night into the American cultural scene and took it by storm. Within three months they had went from one NBA half-time show booking to a schedule which saw them perform for almost every NBA team once, and some twice and more. As soon as the word got out of these evangelists of the "afro-batic" arts, the authorities took notice. They were being called to open the tours for major recording stars like Monica, 98 Degrees and Blackstreet, and getting rave reviews in the process. David Letterman took notice, and called for them to come on his show which they did on July 21, 1999. Their calendar booked up fast and soon they were able to reach millions with their message. The revolution is continuing with every new booking, with every new audience which witnesses the magic of a Mapapa performance. In order to spread the word more completely a second group was added to fill the demand on July 17, 1999. 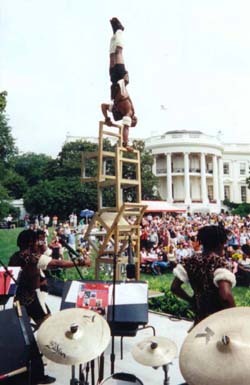 As a result there were two touring Mapapa shows in America, with twice as much exposure for the "afro-batic" concept to the world. The idea that first came to America on the shores of Lake Ontario on that cold February morning was developing into a social phenomenon. The "rhythm circus" was threatening to destabilize the traditional faith that circus' had no place in the new millenium. Authorities take note: Mapapa has arrived! Because they are an experienced professional performing group they can and have adapted their full performance to suit the needs of their clients. From young to old their reception by audiences has been "univer-soul". There can be an educational component, with a multicultural study guide for young audiences. In Europe, they worked almost exclusively for corporate sales meetings and world cultural festivals. In America they are used to open tours of recording stars and televised award ceremonies. Everyone, it seems, raves about these 6 guys from Kenya. What's the secret to their success? 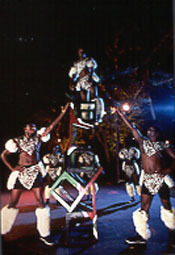 No one has ever seen traditional variety arts and circus skills done African-style. The show is like a high energy dance act, part Cirque du Soleil, part Harlem Globetrotters, which is, above all, fast paced and full of energy. People marvel at the teamwork displayed, the co-operation which exemplifies the rewards of working together. They also have an uncanny ability to get people involved in their show, with conga lines, skipping, acrobatics, limbo and even hand-clapping and laughter. When Matano Ismael, the leader of the group, put this circus show together 10 years ago he had no idea that it would lead to the success that they are presently experiencing in America. "We came off the plane thinking it was a gamble," says Matano. "In my country we have an expression, 'you only live once but you will die many more times second guessing yourself'. So we paid for our visas and our airfares and have hustled with our manager just to get the ball rolling, because when you tell people you are an African circus show, they say 'Oh you said you are a bunch of dancers'. 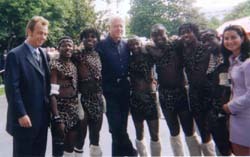 So I would say 'No, we are an African circus show with dancing,' and again they would say 'Oh, you are singers.' And on and on it would go. It was very difficult to explain that we do everything and we do it very, very well." launches, to liven up stiff audiences and energize the most boring meetings. No one has ever seen anything like what we do before! We get people energized, with lively dance music, unbelievable feats of acrobatics that never seems to stop. We are especially well suited for young "hip" companies like those in the computer, electronic, entertainment or information technology industries. This exciting half hour of thrills will motivate, invigorate and participate in the most memorable night they have had in quite some time. Because of the energetic style of our show, it was natural that we would work with almost every NBA basketball team as one of their favourite half time entertainment shows. Since then we have also started doing shows for NFL, NHL, MLB and WNBA teams as well as opening for the 1999World Cup of Soccer and the Pan-Am Games. There is no better 6 - 10 minutes in show business. This is why we are doing so many television shows and concert tour openings. If you want to attract attention to your product with a high energy, pumping show you simply have to call for the Mapapas! This is our bread and butter. 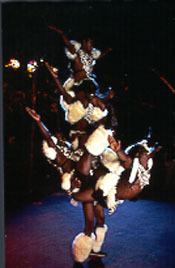 We are obviously a cultural phenomenon which has elements of traditional African dance and music, both taped and live. It has a never-before-seen-in-America quality which is sure to be a hot with audiences everywhere. It is very accessible, so that you can watch the show entirely for its entertainment value and forget that it is representative of a foreign culture. It speaks in the universal language of the imagination. As a background for the education of younger audiences, we have a ready-made study guide and I would be remissed if I claimed that I made it; it was made for us by Maranne Welch of the Pittsburgh International Children's Theatre Festival. This is only one of many North American presenters we have worked with which include: Brooklyn Centre, Chitauqua Arts Festival, Tribeca Centre, as well as several international festival in New York, Toronto, Adelaide, Perth, Hong Kong, Seattle, Chicage, Vancouver, Calgary, Ottawa and more. see! They have have performed at over 300 festivals world wide, including the most recently Nickelodian's Summer Kickoff , Central Park Summerstage, the Music Midtown Festival in Atlanta and more. Send mail to webmaster@capitolint.com with questions or comments.